The United States Congress designated the Petrified Forest National Wilderness Area (map) in 1970 and it now has a total of 50,260 acres. All of this wilderness is located in Arizona and is managed by the National Park Service. About 218 million years ago this area was a vast floodplain crossed by many streams. Tall, stately, pine-like trees grew here, sheltering a myriad of reptiles. When the trees fell, they washed into the water to be buried under silt, mud, and volcanic ash. Groundwater seeped through the logs, bearing silica that later crystallized into quartz, which ultimately petrified the wood. After centuries of burial and upheaval, the land became the high, dry Arizona tableland seen today. 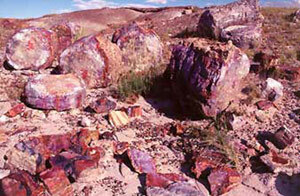 While the forces of erosion sculpted the Painted Desert, they also brought the petrified wood slowly to the surface. In 1906, the United States established Petrified Forest National Monument. By 1962, the area had been expanded and its name was changed to Petrified Forest National Park. Petrified Forest National Wilderness makes up more than one-third of the park. The Wilderness and park are bisected by Interstate 40. The larger portion of the Petrified Forest National Wilderness lies north of the interstate and preserves a portion of the Painted Desert. The other, smaller portion of Wilderness lies to the south. In addition to the petrified wood logs, visitors can observe remnants of petroglyphs and stone houses built by early human settlers to this region, dating back approximately 2,000 years. Wilderness backpack camping is allowed in these areas. Planning to Visit the Petrified Forest National Wilderness Area? How to follow the seven standard Leave No Trace principles differs in different parts of the country (desert vs. Rocky Mountains). Click on any of the principles listed below to learn more about how they apply in the Petrified Forest National Wilderness Area.